Photos courtesy of Bryan Amburgey. Before Pokémon Go brought augmented reality (AR) to the masses, Bryan Amburgey was experimenting with the stuff—with the vision of bringing a unique AR approach to the streets of Long Beach. He was playing around with AR as far back as five years ago, creating images and info-blurbs that pop up on one’s cell phone, generating that enhanced version (essentially a digital feature layered over an existing physical scenario) of reality. 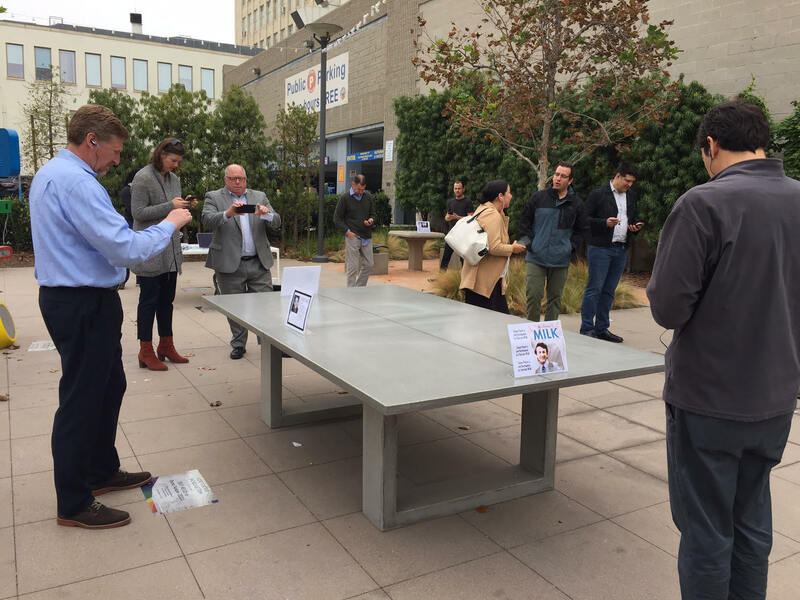 Last week, Amburgey brought his interpretation of AR straight to Harvey Milk Park, as part of the city’s activation of the space, which sought public input last week on ways to invigorate the park with a $300,000 Knight Cities Challenge grant. The AR feature involved various stations dedicated to the LGBTQ icon, Harvey Milk, different photos and blurbs of information about his life projected on the cell phone of a person engaging with the station, like the photo below. The activation and use of AR is the city’s first, although such a feature has gone through multiple iterations by Amburgey, including his accompaniment of artwork on walls at the Acres of Books lot. Incorporating it into the 18-month Knight Cities Challenge “co-creation” project may prove to provide an entirely unique and informative experience for stalwart community members and tourists alike. The project, hosted in collaboration with Citymart, is aimed at bringing people together in a new space, as well as addressing issues of economic city development, underscoring the importance of bringing people and businesses together through public spaces. He imagines such a feature one day in many locations throughout the city (this reporter suggested Belmont Olympic Plaza pool), highlighting different components of the city’s history and aesthetics. Amburgey and Castro deemed last Thursday’s AR feature a “success,” as groups fluctuating between two and 10 people explored the park and took time digesting the information that emerged on screen. “People have been able to learn more about Harvey Milk, which was the goal,” said Castro. Amburgey even talked about an interactive feature that would allow visitors to post photos of themselves at the park and “post” digitally on the “wall,” providing tangible proof of their visit and a completely new way of engaging with a space. What’s more, AR appears to be in its nascent stages. While it’s been used in some tourism scenarios, with apps such as “Wikitude” and “Yelp Monocle,” the city’s utilization of the feature could put it ahead of the curve, tech-wise. Above, left: Photo courtesy of Bryan Amburgey.